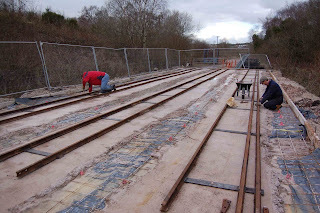 Easter dawned with the Moseley Railway Trust team facing a daunting prospect; the concrete runners had been poured for the storage shed base, and the contractors were itching to carry on (and in their world, time is BIG money). Just one thing missing to allow them to carry on – the track around which the next concrete batches will be poured to give a nice level base for the shed to be erected on. Who’s going to lay the track – guess!! And it had to be done over Easter. So no pressure, then. The statistics are a little scary; there are 24 panels of track in the shed, each 18′ long – that’s 430 feet of track. Or just over 1000 feet of rail – more than you may first expect, as one of the three shed roads is laid dual 2’0″ and 2’6″ gauge, and hence has three rails. MRT members have been cleaning up old but usable rail for some weeks now, and pre-assembling the track panels in the workshop by welding steel strip between the rails as sleepers. That’s 336 individual welded joints, by the way (or almost a whole box of welding rods!). Good Friday saw the team scratching their heads about how to move the panels from the workshop to the shed site – a good few yards away. After some thought, a true narrow gauge solution was developed – a temporary railway and a trolley; load the trolley with a panel, push down the temporary railway to the site and unload. What could be easier? This fine piece of railway infrastructure is seen in the first picture – perhaps the only known picture showing the full extent of this classic contractor’s line and its entire roster of rolling stock. The panels have been bolted to the base (a good workout for the SDS drill), and fishplated together – not as easy as it sounds, as some of these simply did NOT want to fit. Steel angle is welded into each panel to protect the flangeways from the all consuming concrete. That’s another 190 or so welds (or two complete drums of MIG wire!). The final stage is to temporarily pack the flangeways with sand to keep the concrete out. Did we make it? Of course. Inevitably, there’s a few bruises – both physical and egos – but everyone can stand back and reflect on a major job well done. At the end of the day, it REALLY IS about teamwork – not some management excercise or buzz-phrase, but real teamwork. If this doesn’t inspire you to come along and see for yourself, well nothing will (or maybe our next amazing adventure). Read it here first, and you can always get in touch here.